Our second collection of Christmas MR James adaptations, featuring The Stalls of Barchester and A Warning to the Curious. 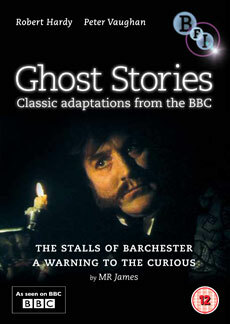 This volume of Ghost Stories from the BBC includes the DVD premiere release of 1971's The Stalls of Barchester starring Robin Hardy, and 1972's A Warning to the Curious (previously released on DVD by the BFI), starring Peter Vaughan. Ghost Stories for Christmas with Christopher Lee - 'The Stalls of Barchester by MR James' (Eleanor Yule, 2000, 30 mins): Christopher Lee recreates MR James famous soirees at which the antiquary would read his tales of the supernatural to eager undergraduates. Ghost Stories for Christmas with Christopher Lee - 'A Warning to the Curious by MR James' (Eleanor Yule, 2000, 30 mins): dramatic reconstruction of one of the author's Christmas readings. Christopher Lee's Ghost Stories for Christmas: The Stalls of Barchester (2000). Christopher Lee's Ghost Stories for Christmas: A Warning to the Curious (2000).